Is This the Proof That Copper Cures Arthritis? Dr. Albert Singer, a noted British physician, conducted a study of 230 users of The Original Copper Heeler insole and found an amazing 96 percent claimed remarkable improvement from wearing the product. 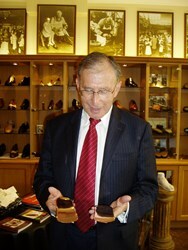 Dr. Albert Singer’s study showed 96 percent of users get better using the Copper Heeler insoles. “I am not taking any medication at all and my pain is gone. All thanks to the Copper Heeler,” Dr. Albert Singer. A Medical study in England showed that 96 percent of patients who suffered from the crippling pain of arthritis improved by wearing The Original Copper Heeler®™ insole. Copper has long been used by practitioners as a form of alternative medicine in the treatment of pain and is an essential mineral that the body needs but many people, especially the elderly are deficient in it. To date there has been no proof it works. However, that could change after an eminent physician was so impressed by the Copper Heelers in treating his own arthritis that he commissioned a study. Dr. Albert Singer, a physician and professor at Whittington Hospital in London, oversaw a study of 230 arthritis patients who were given Copper Heelers insoles to wear and test. An overwhelming majority, 96 percent, reported pain relief, renewed energy and vigor that had been lost from years of debilitating pain from arthritis and other joint disorders. The study was done at Whittington Hospital in London by Dr. Singer and other staff members of the staff and released in 2012. The theory behind Copper Heelers, is that the copper is absorbed through the skin to relieve pain throughout the body even when socks or stockings are worn. Users say relief sometimes starts immediately but more likely takes a couple of weeks for marked improvement. The Original Copper Heeler®™ insole is made of jewelry-grade copper in England and is available in all sizes it can be placed directly into the shoe or attached to a separate insole which can be moved from shoe to shoe. Priced at $49.50 a pair, plus $3.95 shipping. The company offers a full refund if not completely satisfied. More information, customer reviews or to order, visit http://www.theoriginalcopperheelerusa.com or call 1-800-374-5514. The Original Copper Heeler insole. Winning the war on pain one pair at a time. The Original Copper Heeler insole is the leading copper insole in the world and is designed to fit into any footwear either by fastening the heeler with Velcro or by attaching it to a portable insole that can be moved from one pair of shoes to another. The Heeler is made of jewelry-grade copper in England and shipped to the US for its growing customer base. For more information on the Heeler, plus customer reviews and other useful information please visit us at http://www.theoriginalcopperheelerusa.com. Read our blog, like us on Facebook and look for us on Twitter. This entry was posted in Uncategorized on January 26, 2014 by admin. While the Northeast is digging out from another winter storm it is especially tough for those with arthritis and joint pain. While a shovel, snow blower and warm clothes might help deal with some of the issues winter brings, those of us with stiffness and weakness need a helping hand. That’s where the Original Copper Heeler comes in. Designed by London’s leading custom shoe designer, Anthony Andrews, the heeler was created to get customers back into the swing of things. Just pop a pair into your insole or directly into your favorite pair of shoes and in a matter of days and weeks the spring will be back in your step, chores will be easier and life will feel much better. Just go to our website, www.theoriginalcopperheelerusa.com and order a pair or two. Doctors on both side of the Atlantic agree – the Copper Heeler insole works and is winning the war on pain one pair at a time. After a short period of time you will get relief from the crippling effects of arthritis and joint pain throughout the body. This entry was posted in Uncategorized on January 22, 2014 by admin. The Original Copper Heeler insole has helped 100,000 Europeans in the war on pain and has launched a US website. Europe’s leading copper insole, The Original Copper Heeler, has launched a website in the United States,http://theoriginalcopperheelerusa.com, and is making available its line of jewelry-grade copper insoles designed to help alleviate the debilitating and chronic pain of arthritis and joint pain throughout the human body. Studies in the US and England have shown the product works and is an inexpensive alternative to pain-killing drugs and other treatments that mask pain but leave people sluggish and unable to get around. The insoles are designed to fit into any footwear either by fastening with Velcro supplied for that purpose or by attaching them to a portable insole that can be moved from one pair of shoes to another. Copper has been used since Greek and Roman times for a variety of ailments and is an essential element in the human body. The soles of the feet have 250,000 sweat glands and The Original Copper Heeler insole, patent pending in the US, was designed to take advantage of that pathway to the entire body. The product was designed by one of London, England’s best known custom shoe designers, Anthony Andrews, whose clients complained about not being able to get around because of arthritis, hip or joint pain. After wearing the insole for a couple of weeks, most customers report almost miraculous results and many have no need for walkers or canes and have resumed a robust and active lifestyle. Some have even reported postponing or cancelling scheduled surgeries for things like hip and knee replacements. “We came up with this product to relieve suffering and let people live normal lives after years of being unable to do that because of pain,” said Andrews. 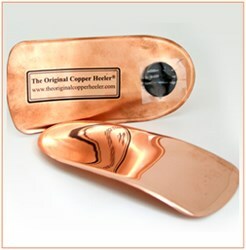 The Original Copper Heeler insole is pure copper and is made by artisans in England. It is available in sizes for both men and women and offered at $49.50 per pair, plus $3.95 in shipping. The company stands behind the product and offers a full refund if a customer is dissatisfied with the product. It is available exclusively online at http://www.theoriginalcopperheelerusa.com and by phone at 1-800-374-5514. The Original Copper Heeler insole is the leading copper insole in the world and is designed to fit into any footwear either by fastening the heeler with Velcro or by attaching it to a portable insole that can be moved from one pair of shoes to another. The Heeler is made of jewelry-grade copper in England and shipped to the US for its growing customer base. For more information on the Heeler, plus customer reviews and other useful information please visit us at http://www.theoriginalcopperheelerusa.com. Read our blog, like us on Facebook and look for us on Twitter. The Original Copper Heeler is winning the war on pain one pair at a time. This entry was posted in Uncategorized on January 14, 2014 by admin. Europe’s leading copper insole, The Original Copper Heeler, has launched a website in the United States, http://theoriginalcopperheelerusa.com, and is making available its line of jewelry-grade copper insoles designed to help alleviate the debilitating and chronic pain of arthritis and joint pain throughout the human body. Studies in the US and England have shown the product works and is an inexpensive alternative to pain-killing drugs and other treatments that mask pain but leave people sluggish and unable to get around. The insoles are designed to fit into any footwear either by fastening with Velcro supplied for that purpose or by attaching them to a portable insole that can be moved from one pair of shoes to another. Copper has been used since Greek and Roman times for a variety of ailments and is an essential element in the human body. The soles of the feet have 250,000 sweat glands and The Original Copper Heeler insole was designed to take advantage of that pathway to the entire body. The Original Copper Heeler USA is about to hit the news…we hope in a big way. We have partnered with the good folks at PRWeb to send out our first news release. We are hoping news sites and printed newspapers pick up on the medical benefits of the Heeler and let their readers know what those of us who already use it know. It works and we are thrilled we made the decision to use it. This entry was posted in Uncategorized on January 12, 2014 by admin. A recent email from Connecticut made the cold weather seem a little less so. A user with really a very tough case of arthritis said that after a few weeks using The Original Copper Heeler and the pain in her legs has started to recede and she gave a pair to a relative who shared the same result. Keep the good news coming America. We are winning the war on pain one pair at a time. This entry was posted in Uncategorized on January 6, 2014 by admin. We have been getting interest in both the US and Canada for information on our amazing product and would love it if our friends spread the word on Facebook and Twitter. You can find us on both and if you can get us some friends we’ll give you 10% off your next purchase. Many people who suffer from arthritis or other kinds of joint pain find winter particularly difficult. It’s the perfect time to get your first pair of Original Copper Heeler insoles and slip them into your footwear and start getting relief. Made and designed in England by master footwear designer Anthony Andrews, the heeler has provided British customers with relief from their pain. The heeler is now available in the United States. Buy a pair today and win the war on pain. This entry was posted in Uncategorized on December 15, 2013 by admin. What is in Santa’s Sack as he Walks Along Abbey Road? Why it’s the Original Copper Heeler insole of course. Santa, like any good marketing person, knows the value of something well-made and durable. Along with Santa on his walk are the creators of the heeler, Anthony and James Andrews. The heeler has been a runaway success in England, where it is manufactured from pure, jewelry-grade copper. Santa has convinced the Andrews’ to start offering the heeler here in the USA and that’s exactly what they are doing. For those suffering from the agonizing and debilitating pain of arthritis, hip or joint pain the Original Copper Heeler insole may be just the ticket to good health. Many customers report after wearing a pair for a few days to a few weeks that they walk pain free and lead better lives. Order a pair or two and find out for yourself. This entry was posted in Uncategorized on December 14, 2013 by admin. So what is Santa doing at Buckingham Palace? Jane and Anthony Andrews, owners of the Original Copper Heeler insoles join Santa Claus, who is known in England as Father Christmas, sharing a pair of the heelers with a lucky Londoner. The heeler is now available in the US for purchase. So if you are suffering from arthritis or other joint discomfort order a pair today. A small investment with a possible big reward.